A single unit of blood can provide up to three patients with life saving treatments. Donating a unit of blood takes about 30-40 minutes. This time frame includes the paperwork that needs to be filled out and the post-donation time in the “canteen” area of the mobile where you are offered juice, water, and/or light snacks. If you are planning on being a first time donor, we can schedule a few mini-meetings between class and church time or after worship between August 15 and September 2. If you would rather talk one-on-one with a “veteran” donor, let us know. 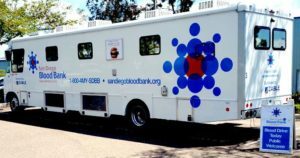 You can call the San Diego Blood Bank at 1-800-469-7322. Let them know you want to donate at Canyon View on 9/9. 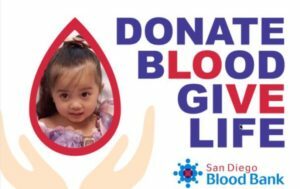 Go on-line to sandiegobloodbank.org website. Go to the appointment tab for mobile donation sites. Put in 9/9 as donation date. Our location will show up there. You do not need to provide an account or log-in to make an appointment. We hope to have at least 15-20 units of blood donated. The drive will be open to the Clairemont community. Blood donors are truly giving folks so we want these visitors to feel welcome on our site. Canyon Villas will also have a representative at this event. If you have questions or concerns about this outreach effort, please click here, or contact Kenneth Heath, Carol Simonson or Barry Day.